I was going to call this post “Half-assed Eggs Benedict” but then I realized the only part that was actually a recipe was the hollandaise. If you are going to make Eggs Benedict the traditional way, it’s hard. Poaching eggs by dropping eggs into boiling water never works for me even with adding vinegar to the water, and Hollandaise sauce is notorious for breaking, not that I’ve ever tried it myself, we all know I’m not a very good cook. But this cheater method makes it easy. And all you need for the hollandaise is a blender. As a general rule, I don’t cook dinner. What I make is rarely worth eating, so dinner falls on Ryan. But he wasn’t feeling well last night and I was on my own. Normally this means I make a sandwich, but I was craving eggs Benedict. I had English muffins, I had eggs, and I already had bacon made (I prefer regular bacon instead of Canadian bacon on my eggs Benedict). All I needed was hollandaise sauce. That’s when I realized, I had no idea what was actually in Hollandaise. It actually surprised me to learn it is lemon based, apparently I haven’t been eating very authentic Hollandaise sauce. I always thought it tasted a bit mustardy. Shows how much I know. For those as in the dark as I am, Hollandaise sauce is a mixture of lemon juice and egg yolks to which you add melted butter. Traditionally this is done by whisking the mixture by hand over a double boiler, being careful not to fully cook the eggs or allow the sauce to separate. This is way above my skill level. Then I found the recipe for blender hollandaise. It claims to be foolproof, and I believe it is, provided to actually follow the instructions. To make the blender Hollandaise, all you need is a blender. Combine 3 egg yolks, a tablespoon of lemon juice, a shake of hot sauce (or pinch of cayenne), and a bit of dijon mustard (helps with emulsion and is tasty) in the jar of your blender and give it a couple pulses to mix. 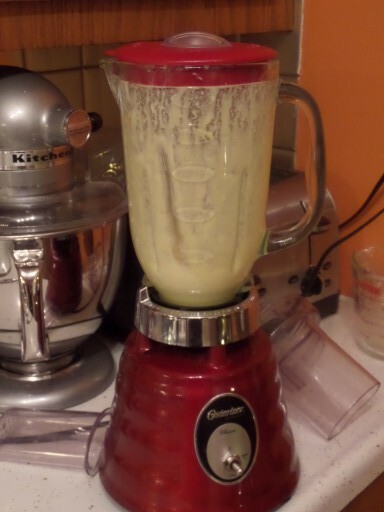 Then melt a stick of butter and gradually pour into the blender, with the blender running. The sauce thickens almost immediately, just keep dripping in the butter. Then give it a taste, you can add more lemon or more pepper if you’d like. Personally I thought it was plenty lemony, but I added several more drops of Tabasco. When you’ve got it to liking, scoop it out and spoon it over your eggs, or asparagus, or whatever else you’d like. Now that you know what to do, here is what not to do. Do not be lazy and think you can do this in a mini food processor instead. I rarely use a blender to the point of having to ask Ryan if we still had one. We did, but it was in the basement gathering dust. So I though to myself, I’m sure my mini food processor can handle it. Nope. I couldn’t have been more wrong. What I ended up with was eggy butter soup. So I tossed that, trudged downstairs and dug the blender out of storage. I washed it, made sure it still worked, and then gave the sauce another go. 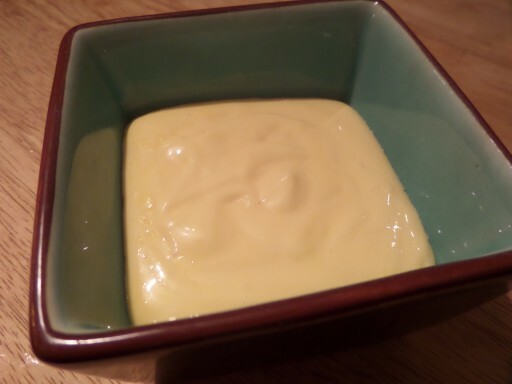 This time it worked perfectly, creamy thick Hollandaise that I had to scrape out of the blender with a rubber scraper. Now to continue with my half-assed Eggs Benedict. I made the bacon using my easy oven recipe, so there was no messy bacon frying to do. Even easier, I had left over bacon from the weekend that I just heated up. Then the poached eggs. I’ve tried before to poach eggs the old fashioned way, breaking them into boiling water. I end up with mess, soggy, oddly shaped egg goo. I’ve gotten it to work, but it is far from a reliable method for me. 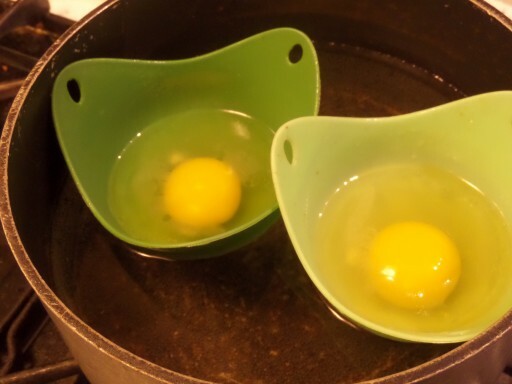 But I love poached eggs, so I have both a poached egg pan and poach pod silicone egg cups. Both of these work the same way. You have a pot of boiling water and a lid, the steam cooks the eggs. 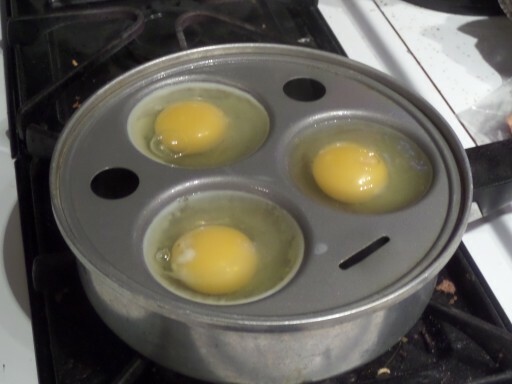 I prefer the pods, because it is so easy to get the cooked eggs out. I spray the pods with a little Pam before I add the egg. I cook until whites are just set, then you just pick up the pod and the eggs slides right out. The downside is you have to be careful that the water is just simmering. I wasn’t watching once and the boiling water bubbled up and over the pods and downed my eggs. So here is my finished Eggs Benedict. 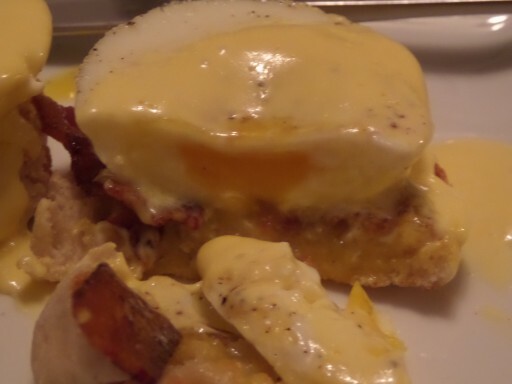 Toasted English muffin, piece of bacon, perfectly poached egg, topped with delicious homemade Hollandaise sauce. Perfect Hollandaise sauce every time. No whisking, no double boiler. Sauce will not break. All you need is a blender. In the container of a blender, combine the egg yolks, mustard, lemon juice and hot sauce. Cover and blend for about 5 seconds. Place the butter in a glass measuring cup. Heat butter in the microwave until completely melted and hot, about 1 minute. Set the blender on high speed and pour the butter into the egg yolk mixture in a thin stream. It should thicken almost immediately. Taste the sauce and add additional lemon juice, hot sauce, salt or pepper to taste. Server immediately.